Simple Ideas to Bring the Holidays to Your Home! ‘Tis the season for holiday decorating! I love this time of year, when we have full license to transform our homes for the ordinary to the extraordinary, and it’s amazing how even the simplest touches can have big impact! Lighten Up! ~ Nothing says “holidays” like lights. We all have our favorites, but my preference is all clear lighting, and plenty of it! Though lighting can definitely be over-done (especially on the exterior), there’s an elegance to a landscape of all clear lights. Wrap them around the trunk and branches of trees, weave them through a garland around your front door, or wrap the topiary on your front porch. Even if this is the only decoration you use, it will give a festive welcome to you and your guests, so be creative, and have fun with it! Play With Color ~ Though rich reds and greens are the traditional colors for Christmas decorating, it can be fun to break away from the expected a bit! Think of brighter greens for a little more glitz, or softer shades for elegance. I love this all white tree from Better Homes & Gardens, and the soft sage green and butter yellows compliment it perfectly. It’s Not Just Gift Wrap! ~ You put time and thought into choosing your gifts, so why not let the presentation show it? Beautiful gift wrap is a simple way to make the season even more festive and special. Even dime store paper can take on a whole new look by using fabric ribbon to tie it up! Use Fresh Floral ~ I too have storage bins full of holiday décor, but I always make a point of bringing fresh floral into my designs. I love mixing the beauty of nature with a little holiday bling! I like how this display from Horchow used fresh greens with the lighted sphere ball. 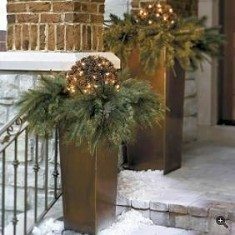 I have these same copper planters on my front porch, and pop a poinsettia in each one, then drape fresh cedar garland wrapped with lights around my doorway. Quick, simple, and beautiful! I hope you enjoy my blogs, and your comments are welcomed! What are your favorite holiday decorating ideas? I’d love to hear them! Kathy, you always have great tips! I love all clear lights too, so elegant. I would like to use more natural elements in my decorating this year as well, cedar, poinsettias, love it all! Thanks for the great tips! I love your suggestion on playing with color and using brighter greens and soft sage green with butter yellows. Such great ideas on lights and incorporating fresh floral. Your entry and home always look amazing this time of year. Can’t wait to see what you put together! Thanks for sharing these tips.